I’ve been spending kind of a lot of time on airplanes lately, and that results in two things: (1) All of these great ideas of things that I want to share with the world. (2) A lot of things to catch up on when I get back into the office, and then I forget all of my great ideas, and then I am tired at the end of the day and don’t want to stare at a computer and try to remember my great ideas. I think I’m going to start bringing a notebook or something on planes, because then I can write things down, but it’s kind of pointless now, because I’m going to stay on the ground for a couple months. -All of the things that I thought about when I was spending a total of 21 hours on an airplane and about 12 hours sitting in an airport in a span of 10 days. Option 2. I’m anticipating that November is considerable less exciting than October, so I’ll write about all of those exciting things in no particular order in separate blog posts. You know, since I’m actually in charge here, I’m going to go with Option 2, because I like to talk, and when I write, I talk in my head while I’m typing, and sometimes I talk out loud. SO. I have grand intentions of typing until my fingers bleed when I am back in the homeland! 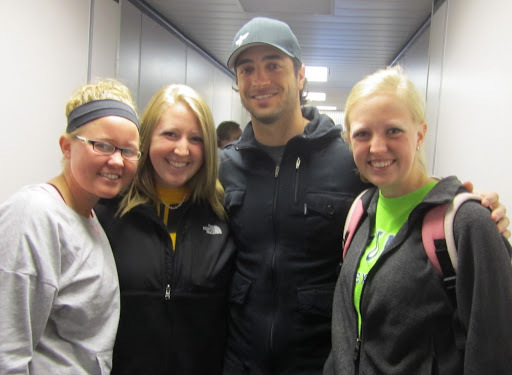 That’s Ryan Braun. If you were wondering. He smells really good.